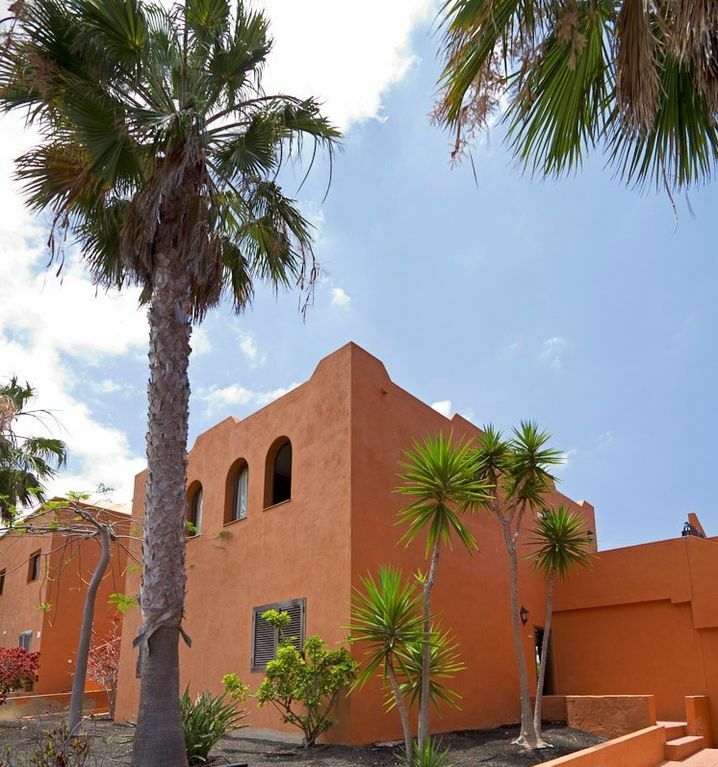 Surrounded by thick walls, directly in the centre of Corralejo and only 5 minutes' walk to the beach. Located on a property of 370.000 sq feet, the feel-good Oasis Royal. On the inside, there is a 100.000 sq feet tropical park with 4 swimming pools among giant palm trees, and a pond with waterfalls. Hidden among the tropical trees in this royal oasis, the buildings in the Moorish style have colours that harmonize with the landscape. Villa Morocco impresses thanks to its Moroccan-style, colourful, and harmonic furnishings. The food you prepare in the fully equipped kitchen can be enjoyed in the living/dining room, or on the large, 300 sq feet terrace. 4 guests will find ample room in the house or in front of the 46' LCD TV (international channels). You can enjoy the sunsets above the palm trees directly from your terrace and the experience will be unforgettable. Tropical park, 2 bedrooms, 4 people, 46' LCD-TV, cable TV, free Wi-Fi, 3 swimming pools + 1 children's pool. Occupancy options: Villa Morocco offers ample space for 4 guests, who in addition to the kitchen, dining, and living area, have two bedrooms available, one with a (4.9 x 6.2) frameless bed, and one with 2 beds (2.9 x 6.2), as well as a spacious bathroom with bathtub/shower over. Activities in the surrounding area: sand dune beach 'Grande Playas', Baku water park, perfect surfing, buggy tours, boat trips to Lobos, ferry to Lanzarote. Clean, comfortable and well situated. We found this property to be very clean and comfortable with everything we could need provided. The location was excellent less than 5 minutes walk from the main shopping / leisure facilities. The harbour is a 15 - 20 minute walk away but taxis were very cheap less than 3 euros to the harbour although there are plenty of restaurants and bars in the immediate vicinity. Would reccomend a stay in this appartment, it has a large balcony which gets the sun from lunchtime until sundown. Maria was very helpful with any queries and got back to us quickly. The complex has 3 swimming pools with plenty of sunbeds. Unfortunately the pool we preferred was closed the last week of our holiday for renovation. The complex is quiet but very central to the main road which has lots of shops restuarants and bars. The aquapark is about a 5 minute walk away. The local bus stop is also only about a 5 minute walk away and buses run every 1/2 hour. Car hire is not a necessity for this rental, but residential parking is available. Myself,husband and two children recently spent two weeks in this property.We had a fabulous holiday and the apartment was perfect for our needs. The only criticisms would be that it could benefit from some air conditioning or at least ceiling fans as it was extremely uncomfortable to sleep at night and the one fan provided wasn't adequate,also we couldn't use the safe as had no communication on how to use it,and the last point which is the most important in my opinion is the lack of cleaning,i have never stayed anywhere for two weeks where no one comes in to clean at least once or change the bed linen,there was plenty of linen in the cupboard and towels but when on your holiday its not something you expect to have to do yourself. A nice lady did knock a couple of times to ask if everything was ok and did accommodate us with a late check out time.All in all though we had a great holiday in a perfect setting. We are happy, that you had a fabulous holiday and that the apartment was perfect for your needs. This august was pretty hot - if you had asked we would bring you a second fan. Sorry about that. The standard booking includes a final cleaning. Also you have extra towels and linen. If you needed more service, you could ask for with extra charge. We hope to see you again. Die Wohnung war im grossen und ganzen i.o. Das Doppelbett zu klein und die zwei Einzelbetten zusammengestellt hatte es für das Mückennetz nicht gereicht, und es hat viele davon. Ausserdem zu laut von den Generatoren vom Hotel nebenan. Kannst nur mit geschlossenem Fenster schlafen, aber dann ist es zu warm. Die Wohnung ist auf einem absoluten Minimum gehalten, klar, braucht vielleicht auch nicht mehr. Mann muss ja nur überleben dort, ausser der Fernseher, der ist zu gross und der Empfang für deutsche Sender schlecht. Hände weg vom Grill auf der Terrasse, minimaler geht's nicht, schon fast gefährlich. Küche klein, Kühlschrank klein, gehts auswählen Essen. Es würde noch viel mehr zum schreiben geben! Komme sicher nicht mehr! Für den Preis kriege ich was bessere. es ist Augst und die Nächte sind warm. Auch gibt es um diese Jahreszeit Mücken auf der Insel. Dafür haben wir im Schlafzimmerfenster ein Mückengitter installiert und zusätzliche Moskitonetze aufgehängt. Das französiche Bett hat eine normale spanische Größe von 150 cm x 180 cm und die anderen beiden Betten 90 cm x 180 cm . Das Wohnzimmer ist mit einer komfortablen Sofa-Liegewiese einer Medienschrankwand mit 46" TV und CD Spieler ausgestattet. Die marokanischen Lampen und Spiegel finden bei den Gästen allgemein Gefallen. Die Küche ist mit einem für Ferienzwecke normalerweise ausreichendem Kühlschrank und allem Hausrat ausgestattet. Schade, dass Sie uns nicht während Ihres Aufenthalts darauf aufmerksam gemacht haben, wenn Sie etwas vermisst haben. Gern hätten wir Ihnen geholfen. Very peaceful place in a great location! Very recommended cozy and comfortable house with 2 bedrooms, a spacious bathroom, a large living room with a wide and comfy couch and a very big tv, a well-equipped kitchen with everything you need. There is also a balcony which faces the garden, equipped with tables, chairs and sun-chairs, so beautiful at sunshine. The apartment is in a tidy complex surrounded by garden and 3 swimming pools (that we however never used), free parking and the most appreciable thing to us was the closeness to the central street, where you can find lots of pubs, restaurants and shops... So great to get out at night and come back home at anytime just by walking for few minutes!!! The only little hitch we found was with wifi: most of times we weren't able to connect (sometimes it doesn't find the wifi, sometimes it find it, but couldn't connect...just a bit better on the balcony)... and when you connect, it is really slow!! Obviously this isn't a big problem if you need internet just occasionally, as we did. In conclusion, I strongly recommend this house to everyone! Great place to stay in the beautiful Corralejo! You will love it! Super Lage, sehr schöne Anlage! Eine super eingerichtete Wohnanlage mit zahlreichen Pools und einem tollen Garten. Die Wohnung ist wie auf den Bildern angegeben. Parken ist auch kein Problem. Angenehmer Kontakt. Ein paar 100 Meter und man ist mitten im Geschehen, bis zum Strand ist es auch nicht weit. Area and location: Centrally located in the town of Corralejo, directly in the calmer part of the main shopping street. You will find shops and restaurants, entertainment - in other words, an oasis reminiscent of Scheherazade. The thick walls shield the houses from view. Inside the oasis, you will find relaxation among palm trees by the pool, while the bustling life outside carries on. Breakfast restaurants, supermarkets, gyms, a car rental agency, a shopping centre (ZARA, MANGO, perfume, jewellery and duty free shops), a steakhouse, restaurants, and the WAKU water park. Only a few hundred metres away you will find Corralejo beach and the Dunas nature reserve. Evening entertainment can be found within a 5 minutes' walk on the main street and the old town: The Rock Cafe, the Corner Rock, or Rosie O' Grady's have live music. There is karaoke in the Bugaloo, the Kimi and in many bars and clubs in the Atlantico centre. Alle Steuern sind im Preis bereits enthalten. CHECK INN / CHECK OUT Check Inn: ab 15.00 Uhr Check Out: bis 10.00 Uhr Abweichende Zeiten für Check Inn und Check Out sind bei Verfügbarkeit möglich.